Photos by David Karp, CVC. Photo rights. Source: Received as budwood from the UCR breeding program, 1966. Parentage/origins: Encore is a late-ripening variety originating from a cross between King tangor and Willowleaf mandarin made by H.B. Frost and was introduced in 1965. Season of ripeness at Riverside: Commerically available beginning in mid-March, but flavor is best from May to July. The fruit is medium in size with a thin, yellow-orange rind. Encore fruits hold well on the tree without much puffing of the rind. Encore tend to be alternate bearing. Monoembryonic; excellent flavor;desirable as home garden variety but non-commercial due to rind spots. Can be held on tree as late as September. Alternate bearing. "Fruit medium in size, strongly oblate in form; rind thin and moderately adherent but easily peelable; surface texture smooth; color yellowish-orange. Core hollow and segments about 11. Flesh color deep orange; firm in texture, but tender and juicy; flavor rich. Seeds numerous, monoembryonic, and cotyledons usually white. Very late in maturity (fully as late as King) and holds especially well without loss of quality or much puffing of the rind. Tree moderately vigorous, upright-growing, and virtually thornless; many slender branches; density of foliage intermediate between the parents. Leaves resembling King, but with narrower blades and petiole wings. Somewhat alternate bearing but productive. This promising, late-ripening variety originated from a cross of King and Willowleaf (Mediterranean) made by H. B. 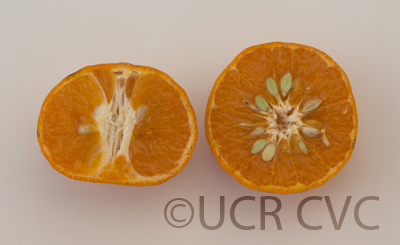 Frost at the University of California Citrus Research Center, Riverside. Encore was selected and introduced in 1965 by Frost's colleagues, J. W. Cameron and R. K. Soost (Cameron, Soost, and Frost, 1965)."